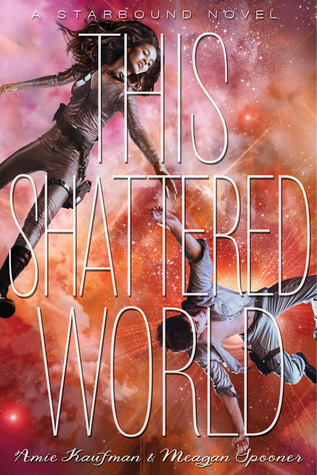 I’m not entirely certain whether I liked This Shattered World more or less than the first book in this Starbound trilogy. And maybe that’s not what I should be concerned about. But the comparisons are there, nonetheless. Because much like These Broken Stars, this second installment of the Starbound trilogy starts off kind of slow and shaky, and took a good long while before I could get into it. It’s disconcerting, especially since I had thought that I would end up enjoying This Shattered World more than These Broken Stars. The beginning of This Shattered World was actually quite exciting with a lot of potential for forward progress and conflict reveal. Jubilee Chase and Flynn Cormac are more the case of star-crossed lovers than Tarver and Lilac had been, but there was so much more depth in their opposing sides. With Tarver and Lilac, it was a class difference as well as a lot of pre-judgments on each side. With Jubilee and Flynn, however, it’s years and years of war, fighting, tragedy, and death between two groups of people. It’s something that’s hard to fight pre-existing opinions and reflex actions against. And also, I found that I liked the whole first fight scene between Jubilee and Flynn, wherein a hot pink cocktail sword pick gets stabbed into someone’s thigh. Now if THAT hadn’t been a sign of fun times between our destined couple to come, I don’t know what would be. Except, after that initial excitement, the story seemed to mellow out for a duration… like say, up until the midpoint of the book. Again, like These Broken Stars, a lot of things happen. But at the same time, the action felt dragged out to non-action and I found myself wondering where this book was trying to head. The consistent back and forth of military against rebels was kind of overdone, to be honest. It’s expected in books like this, but it was also dragged on for too long. I wanted Jubilee and Flynn to start working together soon. But soon just didn’t seem to get here soon enough. The book picks up towards the middle of the book. And as predictable as the plot seemed to be, it was still enjoyable for the latter half, able to keep my attention (finally)... before moving into some strange left-field conclusion that kind of made sense, but kind of didn’t. I don’t even know what I’m talking about anymore. This Shattered World was enjoyable. To be honest, it’s more enjoyable after a duration, but it was enjoyable nonetheless. It was nice to see Tarver again, even if he didn’t comprise much of the action. And for those reading this series after it is already completely published, it looks like we get a slight, hinted at introduction for the next two players for the concluding installment of the Starbound trilogy. I’m quite intrigued, even if I’m not a hundred percent going to jump on that last book. After all, there’s an ongoing conflict that reeks of Big Corporation Conspiracies (because it IS a big corporation conspiracy), and I’d like to see how it plays out. I just also have a feeling I know exactly how it’s going to play out.